Mangas are basically Japanese comic books that have made their way into Western society as well. Manga series like Naruto, Bleach, One Piece or Berserk are highly popular and are often not only available as manga books but also on TV and DVD. Several Manga community exist on today's Internet that offer access to Manga scans online, some even with the option to download the manga books to the local computer system. We have reviewed several programs in the past that add better options to read and download mangas from the Internet. This includes the One Manga Reader, Manga Meeya or the Manga Downloader. We have also been criticized in the past for reviewing these applications, largely because the programs and extensions offer means to download Mangas, which may not be legal depending on the downloader's jurisdiction. Still, we are a technology news site that reviews software, not lawyers that can determine whether or not the use of a software is illegal in one of the world's 200 or so countries. Manga Crawler is a free software program that acts purely as a downloader. It is compatible with several Manga websites, including OneManga, 1000Manga, MangaShare or MangaRun. The application displays all compatible servers in the left column. Selecting one of the servers will pull the available Manga series from it. These series are then displayed in the second column. 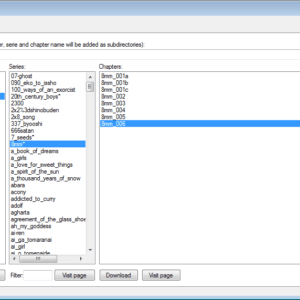 The selection of a Manga in the second column pulls the available chapters from the site's server. 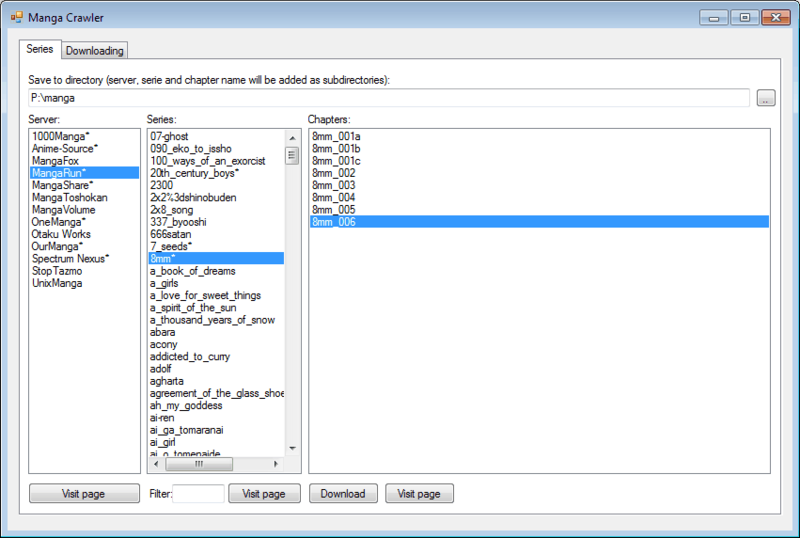 Selecting one or multiple volumes, and clicking on the download button will download all pages of the selected Mangas. It is furthermore possible to click on the Visit page button to read the Manga on the original website. The Downloading tab displays the download queue and a log that lists errors and download paged. Manga Crawler is an easy to use portable software, it does not take more than a few clicks to start reading or downloading the selected Manga. The program had difficulties downloading information from some Manga servers, trying again at a later time resolved some of the issues. Manga Crawler can be downloaded from the projects website over at Codeplex. This is great. Pulls down the pages quick and easy and couldn’t come at a better time when places like OneManga are starting to remove their pages. A tip for better reading – it will download the pages as individual image files so zip them all together and rename the .zip as a .cbr for use with your favourite comic reader.